U.S. commuter rail agencies are making strong and continuous progress toward installing and implementing Positive Train Control (PTC), according to an APTA analysis announced at an Aug. 14 media event. These advances, as of June 30, 2018, reflect the commuter rail industry’s ongoing commitment to safety and to implementing PTC by the statutory deadline. APTA President and CEO Paul P. Skoutelas; Jeffrey D. Knueppel, general manager of the Southeastern Pennsylvania Transportation Authority (SEPTA) in Philadelphia and chair of APTA’s Commuter Rail PTC Subcommittee; and Jim Derwinski, chief executive officer/executive director of Metra in Chicago, participated in the conference call. Knueppel noted that trains on all 13 SEPTA Regional Rail Lines are equipped and operating with PTC and said his agency is “proud to have implemented this safety technology for our customers and employees.” SEPTA, he said, has already invested $337 million to implement PTC. He continued, “Working with our freight partners, we expect to have PTC implemented or in revenue service demonstration on six of our 11 lines by the end of 2018, and to complete the job by 2020.” Derwinski estimated that Metra will spend approximately $400 million by the time the agency is finished installing PTC. 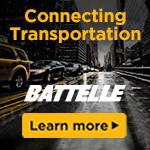 * Submitted a plan and schedule to the Secretary of Transportation for implementing a PTC system. 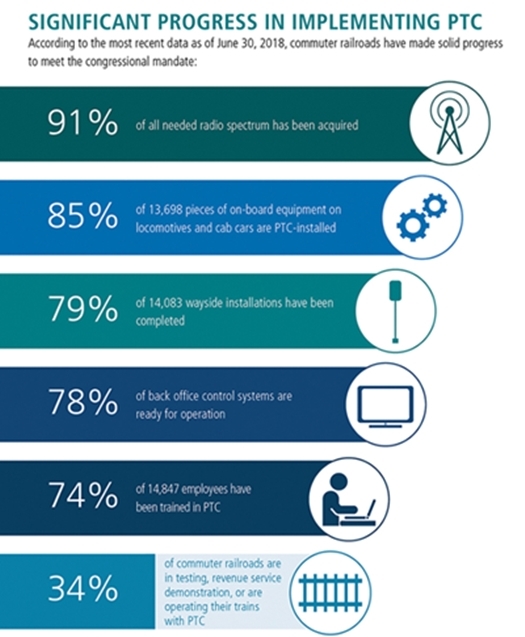 Once these milestones are reached by the end of 2018, commuter railroads must implement PTC as soon as practicable and no later than Dec. 31, 2020. APTA noted that, at a time when the national transit state of good repair backlog is an estimated $90 billion, the commuter railroad industry’s cost to implement PTC will exceed $4.1 billion, diverting funds from other critical infrastructure priorities. Since Congress mandated PTC, the federal government has awarded $272 million in PTC grants, with an additional $250 million made available in May 2018. APTA has created a special PTC website with more information. Click here.